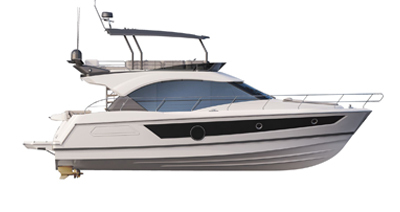 It is easy to organize a day outing off the top of your head with the Antares 7. With a length of 7.5 m and beam of 2.53 m, she can be transported by road. The modular bench seat creates an additional double berth, so you can welcome 4 people on board the Antares 7 for an overnight trip. Suiting all tastes and situations, the cockpit’s aft bench unfolds into a large sunbathing area. 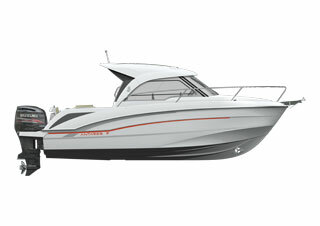 The Antares 7 has an amazing level of equipment for a boat of its category: lots of storage, small fitted galley area. Electric windlass available on option to make dropping anchor easier. Single outboard engine - maximum power 175 HP - holiday pack Suzuki engine. Cockpit saloon option (removable). Converts into sun-lounger. Lockers under seats. Opening roof with black-out blind (option) on wheelhouse. Fore cabin: double berth with separate bathroom. Small galley: sink, with manual pump, place for hob, worktop, 45 L refrigerator (option). Facing saloon seats (4 people) with panoramic view of the exterior. Converts into berth. Wooden table. Driving station: bolster function seat, control panel with space for electronic navigation. Copilot seat : 2 positions.